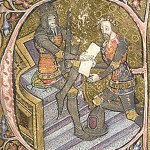 Sir John was one of the most successful of King Edward III commanders in the wars in Northern France and the Low Countries. 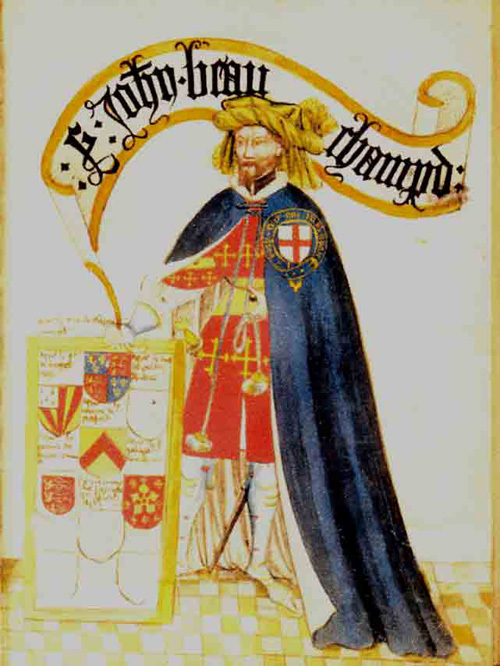 He fought in Flanders in 1338; was present at the array at Vironfosse when the armies of the English and French kings met but did not come to battle in October, 1339 ; and took part in the sea battle of Sluys on 24th June, 1340.
dward, Prince of Wales and eldest son of Edward III, played a key part in the great victory over the French at Crécy on 26th August, 1346 even though he was only aged 16 at the time. 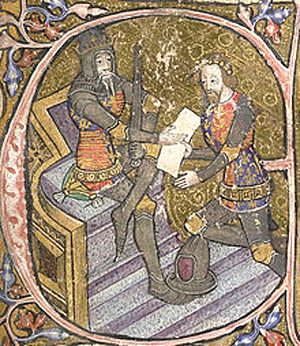 Known as Edward of Woodstock during his life time he became known as the Black Prince after his death, possibly due to the black armour he wore. During the battle Sir John carried the Royal Standard whilst fighting alongside the Earl of Warwick and his brother-in-law, Lord Say. 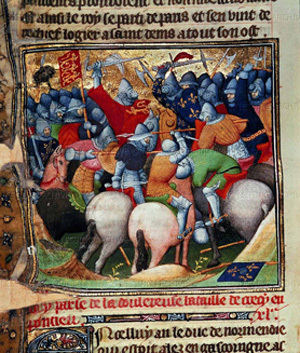 Sir John was also present at the successful siege of Calais which lasted from September, 1346 to August, 1347, which gained possession of Calais for the English Crown which retained it until 1558 when it was finally lost in the reign of Mary Tudor, who reputedly said “When I am dead and opened, you shall find ‘Calais’ lying in my heart”. 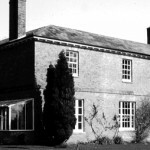 Monketon, (now Gooseberry Hall Farm) consisting of eight acres of arable land; unspecified land at Adesham (Adisham); 24s rent of free tenants at Fredevill; tenements at Easole consisting of a messuage with dovecot, 60 acres of arable land and 12 acres of pasture all held of the Abbot of St. Alban’s, part of which is now Beauchamps; Wyngeham (Wingham), no details specified but probably refers to property in Nonington held from the manor of Wyngeham, most likely in North or South Nonington; Godneston (Goodnestone), 5s land-unspecified. Sir John also had other Kent property. He held the adjoining manors of Silham and Mere in the southern part of the parish Rainham some 34 miles south of London on the Dover road, and also the Manor of Cheddyngston, now Chiddingstone, in the parish of Cobham parish on the same road some seven miles closer to London. Nonington is some thirty-five miles or so from these holdings. The Ratling Fireball:– On December 11, 1741, a fire-ball appeared soon after noon-day, and the sun shining, but few people saw it, and they could only guess at its course; which, however, was observed to be from north-west by north, to south and by south, and right over Littleborne from Westbere, and towards Ratling, near which place lord Cowper (the owner of Ratling Court), who was hunting, heard but one explosion (for there were two); the other most probably happened at such a distance, as to be in one with that so near him. Mr. Gostling, of the Mint yard, who gave the account of it to the secretary of the royal society, says, that he found his house violently shaken for some seconds of time, as if several loaded carriages had been driving against the walls of it, and heard a noise at the same time, which he took for thunder, yet of an uncommon sound; though he thought thunder, which could shake at that rate, would have been much louder, therefore he concluded it to be an earthquake; the sky, he found, was cloudy, but nothing like a thunder cloud in view, and there was a shower of rain from the eastward presently after, the coldest that he ever felt. The “Ratling Fireball” was almost certainly ball lightning, an unexplained atmospheric electrical phenomenon and observers of it frequently refer to luminous, usually spherical objects, which vary in size from pea-sized to several meters in diameter. It is usually associated with thunderstorms but the phenomenon often lasts considerably longer than the split-second flash of a lightning bolt. 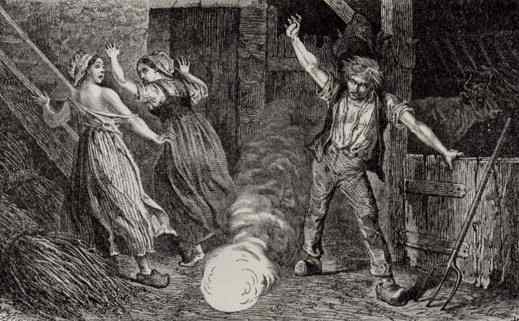 Many historical reports refer to the ball exploding, often with fatal consequences to persons and livestock, and leaving behind the lingering odour of sulphur. The above letter is taken from Philosophical Transactions Vol 42 1742-43, published by The Royal Society. William Gostling (1696 – 1777) was an English clergyman and antiquary. Noted as an historian of the City of Canterbury, he wrote a well known guide to the city.